Visualisation for the Insen Tour of Alva Noto & Ryuichi Sakamoto in 2005 and 2006. This one i did within an hour when i had access to the complete LED screen for the first time. The tour had already started. When you would display just one colour on the whole screen you could see the edges of each LED module. So i just used these edges for the display of the lines. Each stroke of a key on Sakamotos Yamaha Disklavier would send out a MIDI signal that would call a random preset of predefined patterns on the screen. 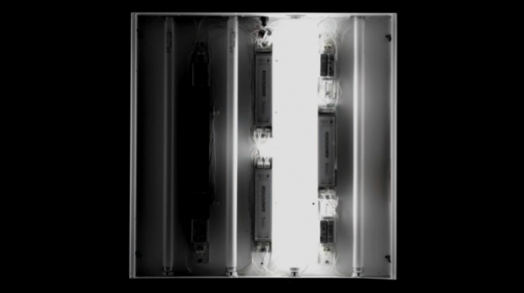 Realtime visualization of Prayer by Burial with one of my Rasterdecks - a grid ceiling element with four fluorescent tubes. Surround sound installation with synchronized florescent tubes. Six speakers on tripods. One fluorescent tube attached to each tripod. The video shows a short excerpt of the first setup at Hafen2 in Offenbach near Frankfurt as part of the Luminale 2010 and part of the exhibition series "Words & Sounds" curated by Hortense Pisano. The main elements of the music, piano and sine waves, are represented by two elements. Abstract keys fade away like the piano sounds fade out of your mind. Horizontal stripes display the sine waves frequencies with their vertical position.